We are excited to announce that with the latest version of Feedback Hub, you can now share feedback items, Quests or any other content easily with short URL links. 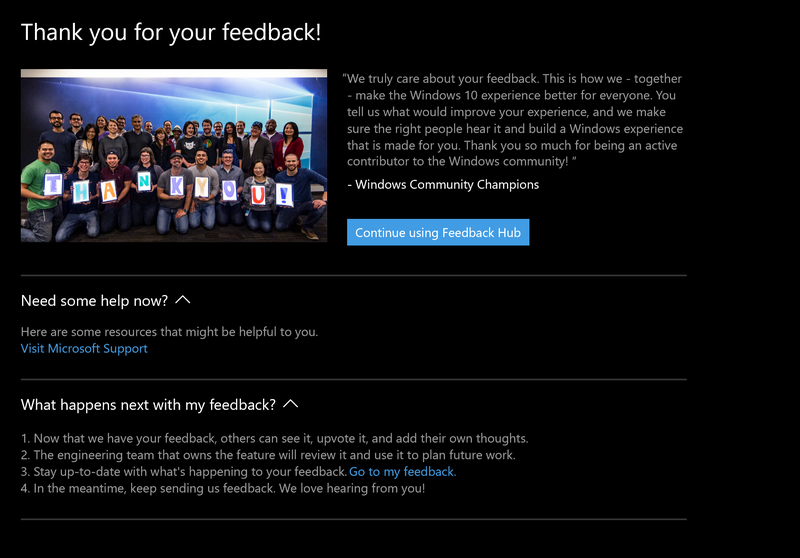 Teams at Microsoft value your feedback, and we wanted a better way to say thank you. So why not show you some of the people (our Community Champions) who are constantly reading your feedback and translating it into improvements in our products and services. A help section. For those of you who need help immediately, you might be able to find some solutions here. Additional information about our process for leveraging feedback. We are very grateful for your feedback and we hope that this new Thank you page conveys that!